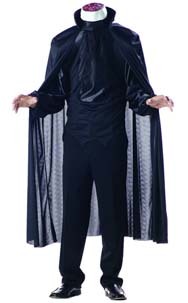 Scare the life out of the other guests at the fancy dress party with this scary and effective Headless Man Fancy Dress Costume. Inflatable shoulder pads raise the level of your shoulders up to the top of your head, upon which sits a head piece which forms the severed neck of this character with nasty blood stained spinal column, veins and arteries, yummy!. The costume then slips over all of this and hey presto you are headless. The waistcoat, cape and collar are all in one piece, made of lightweight polyester and the collar has a piece of gauze like material that covers your eyes, so that you can look out under the headpiece and the horrified onlookers cannot see in!